With a 2.0 /4 ... Is there any options for getting the look (without sacrificing performance) of the dual exhaust like you see on the factory /6 and in particular the factory GT cars? I thought Dansk had an offering for this, but can not locate it now. 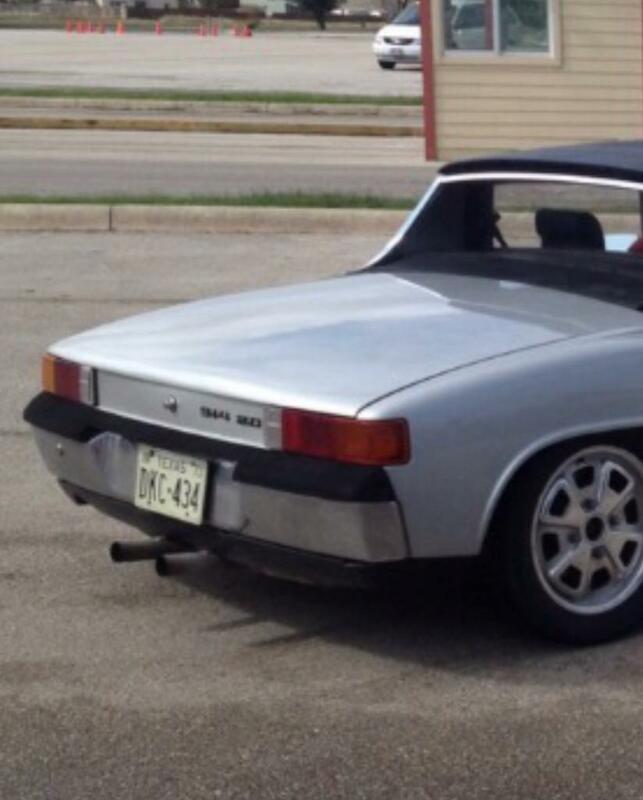 Basically I'm after the look of separated tips coming straight out, but not really close together (like boxster, etc). Don't need chrome tips. I'm always confused why you see the 1.7s with dual tip ansa mufflers (I don't want duals on both side for my 2.0) , but the 2.0L cars always get a single tip. 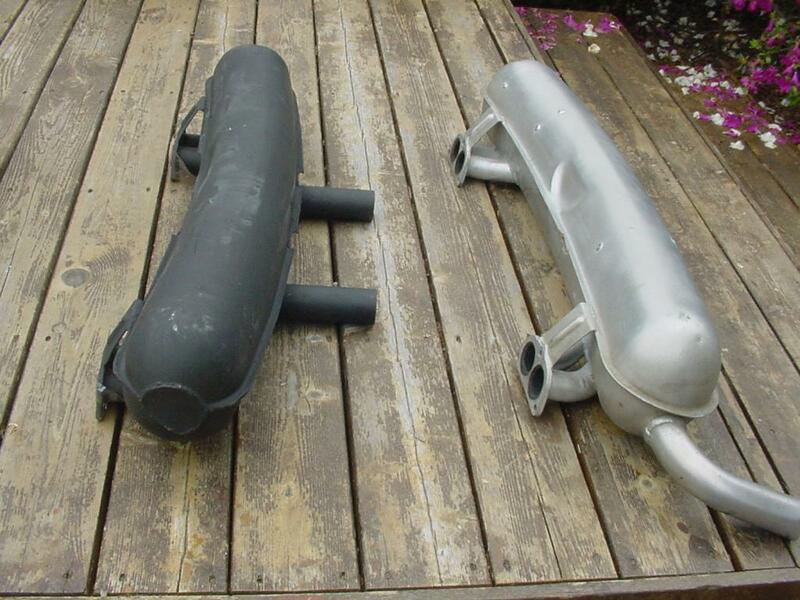 Also, I see there are some "GT" style mufflers for /6 cars... but then there are size differences amongst the /6s, could none of them be used on a 2056cc type IV based on a stock 2L ? Any other options? 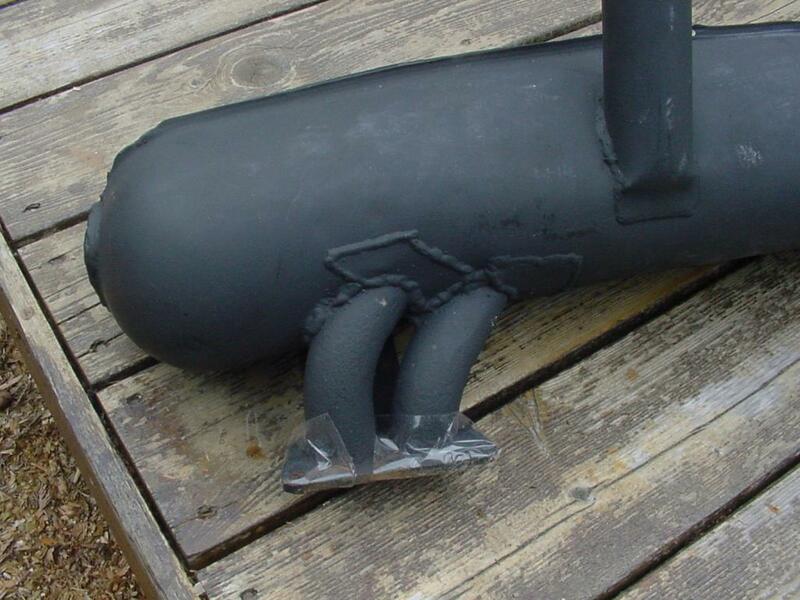 All stock muffler for the 4 cylinder cars were single outlet mufflers. 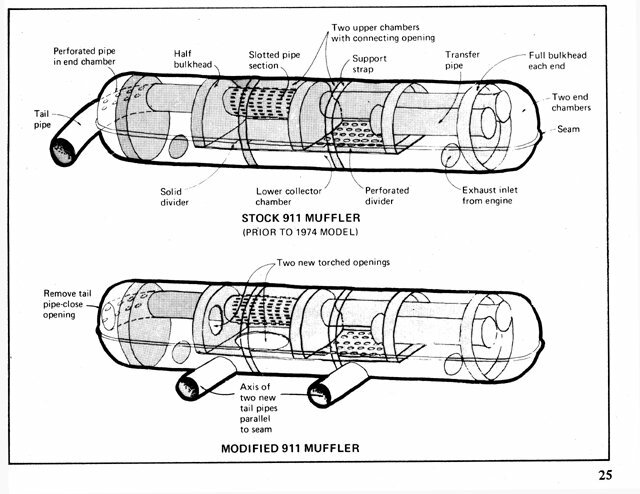 Most aftermarket mufflers that were available were available for both 1.7/1.8 and 2.0 engines. Dave of Triad makes a 2 outlet muffler for both 1.7/1.8 and 2.0 engines. How ever Dave has taken some time off from making mufflers. So if you are patient you can wait until he is back in production. Tangerine Racing makes two version of dual outlet mufflers for 2.0 4 cylinder cars, a center dual outlet and dual side outlet. Options exist, it just takes time and/or money. Not that I don't like the above set up, but it's a little more Italian looking than I'm after for my 2.0/4, I actually have a very similar unit currently in my spares parts stash from a 1.7 car I recently purchased. 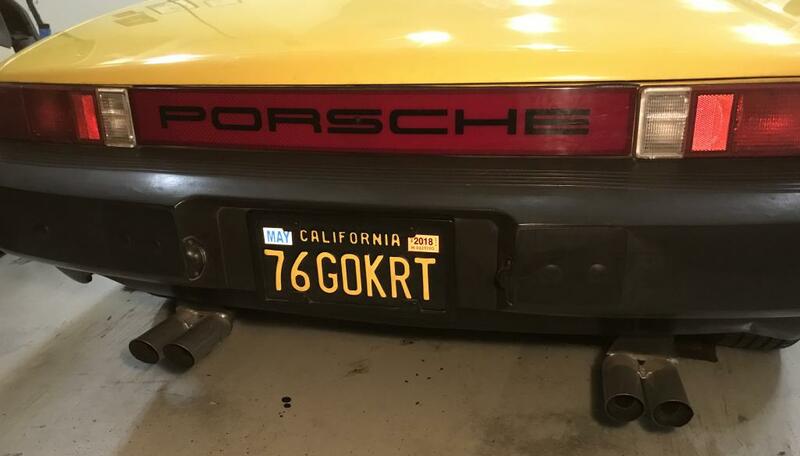 I'm after more of an original looking set up... like a dansk "banana" style sport muffler w/ two plain exit pipes coming straight out the back. The tangerine unit is an option I guess but the pipes curve and exit out the sides, from what I can tell. I'm sure there's a good answer, but I'll go ahead and ask 'cause I don't know - why wouldn't a dansk unit for an original 2.0 /6 not work for a 2056cc 2.0/4 ? ... is it something as simple as the flanges not lining up the same between the 4 and the 6 ? or perhaps hanger bracket's the problem? Is there some magic inside that would kill power if used on the /4? Both engines are (were) 2.0L after all, and with the increased displacement to 2056cc for the /4 - the HP would be at least similar. In my research, apparently dansk did make a dual exit unit for 1.7/1.8 engine but it's NLA. Does not seem like they made one for the 2.0/4, why not? maybe they intended it to use the same unit as the original /6? Thoughts, info? ^Thread about 2.0 "GT" muffler. Given how heavy the Monza style exhaust is, I wouldn't consider it a performance enhancing part. I had one on my '75 for a while and liked the look, but got rid of it mostly because I was tired of setting off car alarms in the garage at work. 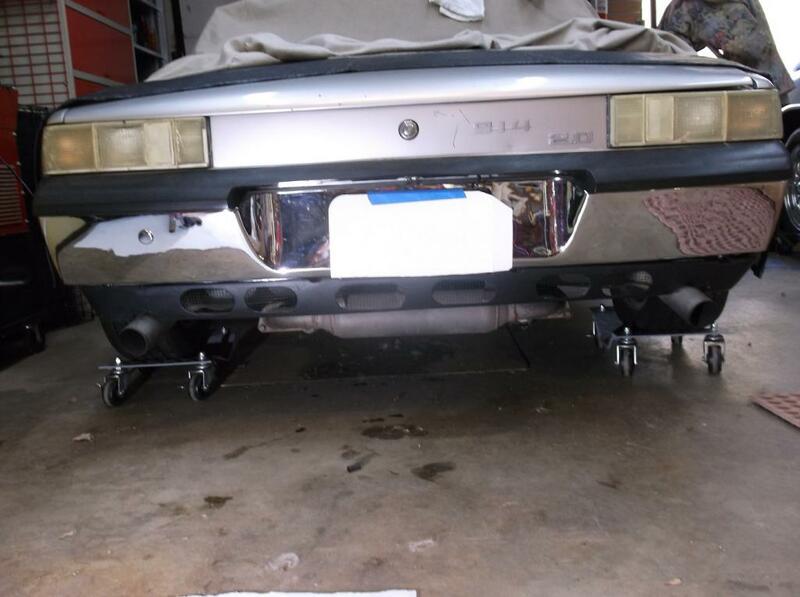 Monza, manta, and one other make the dual (not duel) outlet muffler. They are heavy, and sound awful. A performance muffler, they are not! Again, not the type I'm after as stated a couple different times in this thread. Yep, I'd already read that one before posting. I'm not sure if the original poster of that thread read the german ebay add clearly enough to tell if it was intended for the /4 2L or the /6 2L ... He may have just read "2.0" and assumed it was for the /4. He did not post a link to the add or a model number. As I mentioned earlier I've found mention of these for the 1.7 & 1.8. Either way, I can not located that particular muffler now, or a german Ebay add for it now, unfortunately. Just make one out of a stock 2.0 muffler. Here’s one I made maybe 20 yrs ago that is still on my car. The tangerine unit is an option I guess but the pipes curve and exit out the sides, from what I can tell. I did a special one similar to your search, for Tom Roth(troth). He might have posted a pic or two, not sure. 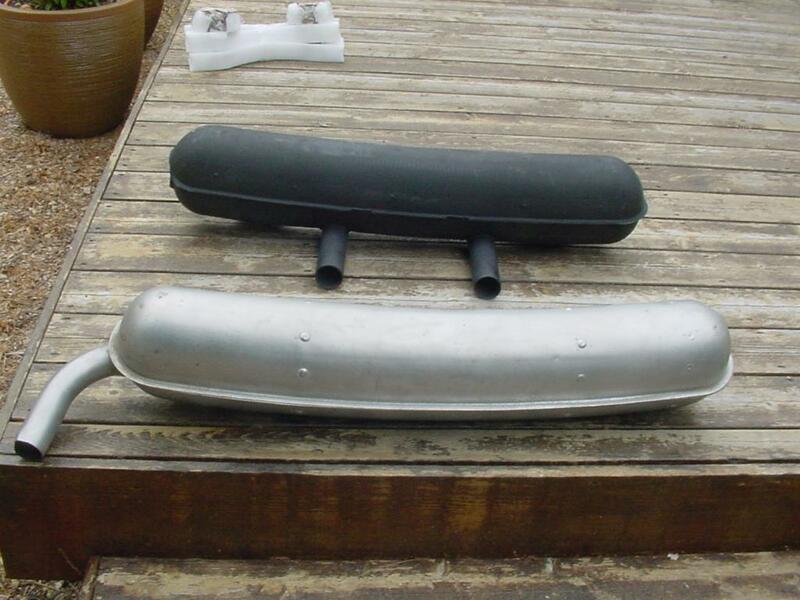 I bought a muffler that had been converted like that at a swap meet many many years back. Holy crap it was loud! Got rid of it and went back to my "thoroughly blown-out" stock muffler. Then went to a Bursch. The dual-out was the loudest of any of those. This picture has been floating around sport muffler threads in the past. I also modified a FG Rear Valance to "Hide' the muffler. Also noticeable difference in performance . 6 and 4 heat exchanger flanges are completely dif. 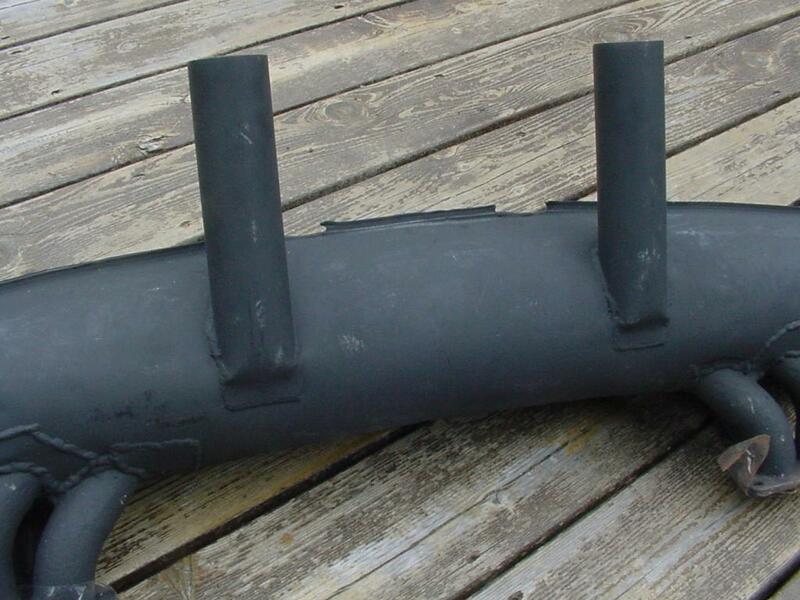 The muffler for a 4 you decide upon must be compatible with the heat exchangers on your car. It's all about the heat exchangers. This is the 911 muffler and earlier in the thread someone asked if there was a reason it could not be installed on a 4 cylinder 914. I know the inlet pipe flanges are different from 6cyl to 4cyl. 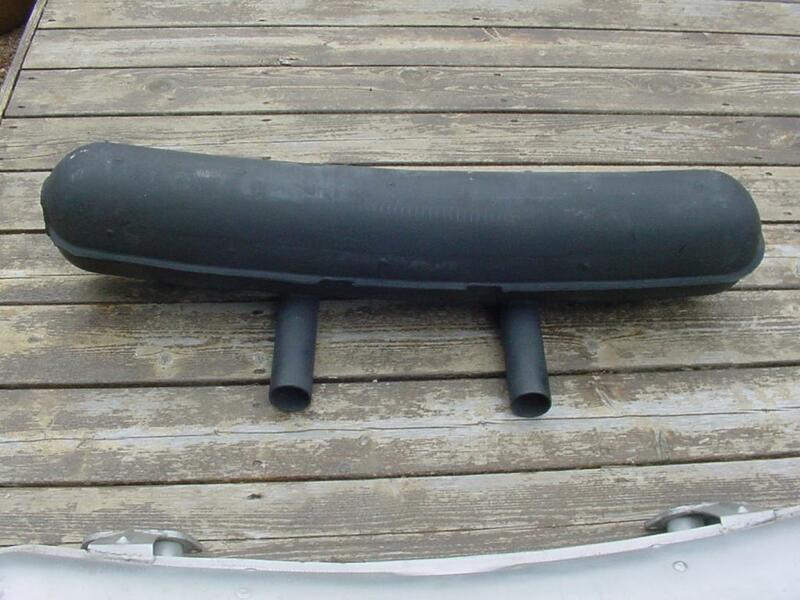 Does anyone have pictures of a 4 cylinder muffler they have cut open? It would be interesting to see the insides of one. I have a triad dual outlet muffler with 1.7/1.8 SSI HEs that came with my car but have never had it running yet to know how it sounds. Looks nice hanging in my shed but it is heavy. I'd never modify a perfectly good Bischoff for dual tip. I bought a dual tip that someone else had done the hard work on. loud? probably. But Dave, I'm wondering if that could have been because the internals were all just removed on yours (for track use possibly), rather than a couple of port holes cut in the bulkheads as per usual. From reading, doesn't seem like many complain they're too loud.. but I could certainly see it if internals were removed.